In the aftermath of the Fed's latest rate hike on Wednesday, which despite a hawkish dot plot was dovish in its removal of the "accommodative" language - a staple of the ZIRP period over the last decade - there was some immediate market confusion as to what the US dollar should do next, with a kneejerk reaction first lower, then higher, before eventually settling at unchanged. It was not meant to be, however, and today the dollar has resumed its ascent higher, rising to the highest level since September 17, amid a sharply weaker Euro (due to the return of the Italian budget drama), Yen and even Yuan (overnight the PBOC failed to raise rates as it has traditionally done in the past alongside the Fed). And while the market may have finally realized that there was little dovish in the Fed statement, especially after Powell explicitly said that "accommodation" remains, largely as a function of easy monetary conditions, and is starting to price in another 3 hikes in 2019 (after the December rate hike which now also appears guaranteed), a more notable move has been observed in various FX basis swaps, all of which are blowing out today, and are back to the widest levels of 2018. It's not just one pair, but an across the board move, which suggests that overnight there has been a sharp repricing of dollar liquidity. What may be causing this? 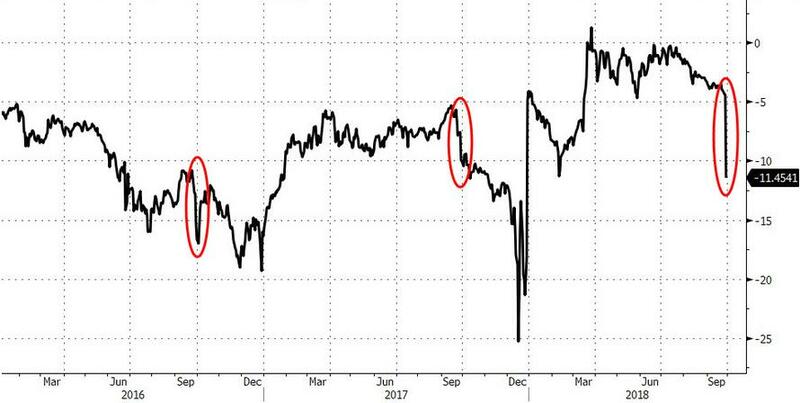 Two possible explanations have emerged: i) contrary to popular narrative, the Fed's hike was not priced in and a rate differential-driven imbalance emerged, resetting basis swaps to reflect a continuation of the tighter US regime; ii) quarter end is approaching and coupled with the rate hike, financial institutions suddenly find themselves very short dollars. Whatever the reason, the consequence is clear: there is an acute dollar shortage. 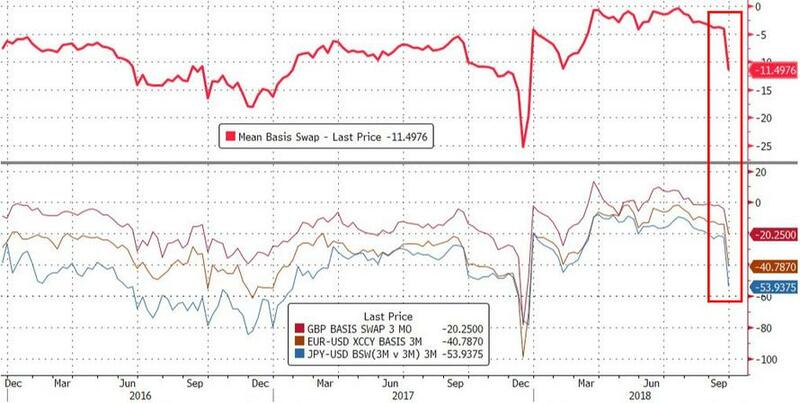 Meanwhile, one consequence of this basis swap repricing is that USD-denominated treasuries are suddenly more expensive to hedged foreign buyers to the tune of roughly one rate hike. Which, all else equal, would mean that there is now that much less demand by international buyers for TSY paper on the long end. Could this shift in supply-demand mechanics impact the yield on long-dated paper? 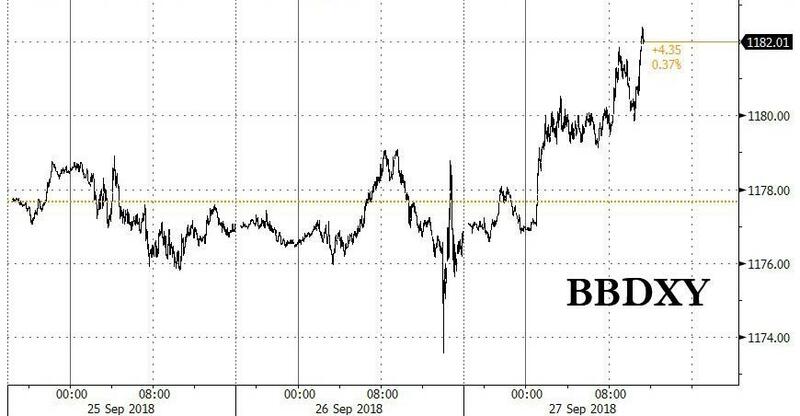 Judging by the leak wider in the 10Y yields which alongside the dollar were trading at session highs, all those traders who have been praying for at least some steepening in the curve may finally get their wish. The second question is whether the latest Fed hike, and the sharp move in basis swaps, indicates that going forward every incremental rate hike will finally result in sharply tighter financial conditions.